Pumpkin Chocolate Truffles are smooth, creamy chocolate truffles with a hint of pumpkin pie flavor from pumpkin puree and fall spices. The pumpkin is subtle but adds a lovely autumn taste to these candies. 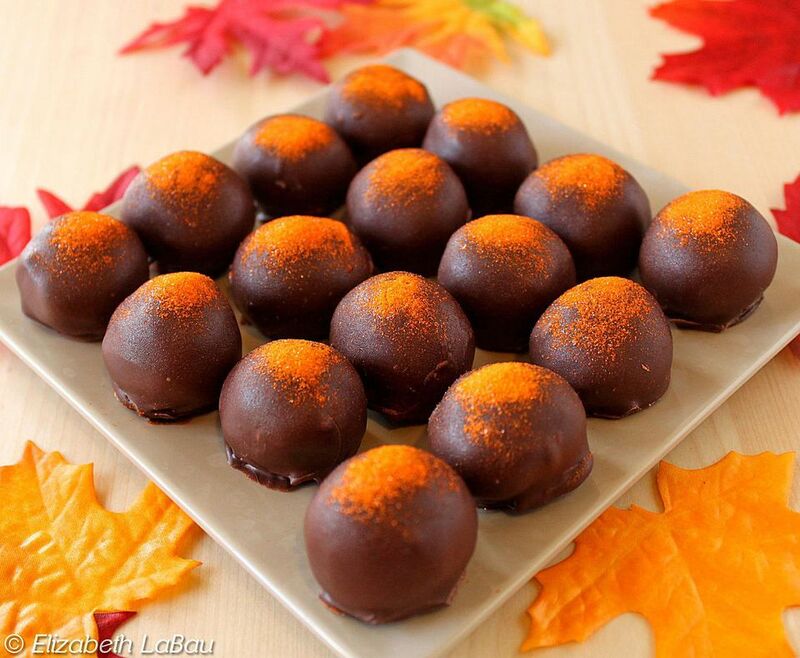 Pumpkin Chocolate Truffles are perfect for Halloween, Thanksgiving, or any fall occasion. Place the chopped chocolate in a heat-safe bowl. Combine the heavy cream, the pumpkin puree, the salt, the cinnamon, and the nutmeg in a small saucepan over medium-high heat. Whisk until the pumpkin and cream are smooth. Heat until the mixture just starts to boil. Pour the hot cream through a strainer over the chopped chocolate—this will strain out any large pieces of pumpkin puree that might interfere with a smooth truffle texture. Whisk the cream and chocolate together until the mixture is shiny and completely smooth. Allow it to cool briefly. When it is still warm but no longer hot, whisk in the butter until it is incorporated. Press a piece of cling wrap on top of the chocolate and refrigerate it until it is firm enough to scoop, about 2 hours. When the chocolate is firm but not rock-hard, use a candy scoop or a teaspoon to scoop up small balls. Dust your hands with cocoa and roll the truffles between your palms to make them round. Melt the candy coating (or alternately, temper real chocolate) in the microwave until it is smooth and fluid. Dip the truffles in the coating, one by one, using dipping tools or a fork. If you desire, top them with orange sprinkles or other decorations while the chocolate is still wet. To get the effect in the picture, I liberally dusted the tops with orange sanding sugar. Refrigerate the truffles to set the coating, for about 10 minutes, before serving. Store Pumpkin Chocolate Truffles in an airtight container in the refrigerator for up to a week, and bring them to room temperature before serving.